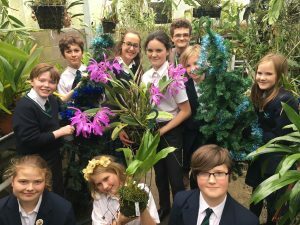 Today we dusted down our rather naff Christmas trees and started to plan Orchid Christmas 2017. For anyone who has not been before, Orchid Christmas is an evening of orchids, mince pies, mulled wine and Christmas music and one of our favourite evenings of the year. This year Orchid Christmas will be on December 13th from 6pm until 9pm and we are planning all sorts of great activities such as a Chrsitmas orchid treasure hunt for adults and children, orchid sales of course, cards, paintings, a repotting service, orchid seedling gifts – in fact everything you could want on a December evening. Everyone is welcome – adults £2, under 18s £1 entry includes a free drink and cake.